Week 43: Getting settled in. This week began running sessions again in our new hone Studio 31 at The Factory. It was great to see people in there and using it just as we imagined. Having the room to move around and work, people working as a group or moving away to talk. People spreading out. It was also good to see how everyone pulls together to make something like this work. Still a lot to get done. We are aiming to have and opening event on the 8th November. Still need to get the hanging system in place, paint one room, get a large sink plumbed in, install the water beverage boiler, set up the forst exhibition, get the fire extinguishers sorted out, sort out the filing cabinet with the paperwork, put up the coat hooks, sort out the resources and generally look ready. We had our first session in the new unit “Studio 31”. The 2Create group were working on all sorts. The main group were working on top of old bits of text from an out of date maths book and other sources. One person was painting stones and some worked on finishing a giant group zentangle. Great to have all the space and the fascilites. Just can’t find anything. It’s like moving house, everything is in a new place and hard to find! Now where did we put those rulers! On the Kentmere ward the session was partly run by one of the participants. She showed us how to create decorated initials and zentangles. We used fine black pens to create intricate patterns within the initial. This simple but effec…tive technique encouraged two new participants to join the session. Its repetitive nature made it very therapeutic. It was also very pleasurable to do, enabling each of us to create very effective final designs. It was lovely to welcome old faces back, and also to welcome a new participant. As always, we worked on a variety of different activities. A few of us started making little houses from card, with a view to having a compl…ete village for Christmas!! Others in the session sewed, embroidered, needle felted, drew and painted. There was plenty of discussion about future sessions, and of items that we could create for forthcoming Christmas fairs. This week the Deaf Art group were working on making pots and decorating them. They used the cut off bottoms of different shaped plastic bottles and acrylic paint. In our first WellArt session at Studio 31 we have been creating poppies. We plan to have a bit of a display in place in our gallery ready for the 11th. Some were made out of clay ready to be painted and some used pen and ink. There were some pastels sketches in progress too. We had a busy week this week moving into our new home at The Factory in Kendal. Lots of furniture to move and unpacking. We still have lots to do in the coming weeks but our usual sessions will start up again from next week. Check out the menus for each sessions details. This week on the ward session we used air-dried clay. ‘Air-dried’ means that the clay doesn’t need to be fired, and will dry hard in the air alone. We made coiled pots, and one participant started to build a miniature house. Clay is very therapeutic to use, and we found in the group that we were able to talk and share ideas as well as create our pots. After many weeks of hard work we put up three windows this week around Kendal for the trail. 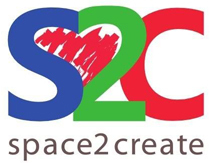 Space2Create had two large windows in Game. Lloyd was creating a display of his own for Thuline’s. Mat created a window of his own work for Gentry. All three windows look amazing. Thank you to all the people that helped. The windows a attracting lots of attention and comment which can only be good for the group and artists involved.